LANGE Q&A Radiography Examination contains more than 1,400 registry-style questions to get you ready for the licensing exam. Written by a respected radiologist with 35 years of teaching experience, the book reinforces concepts by including explanations for correct and incorrect answer options for each question. From cover to cover, this tried-and-true exam prep tool is filled with everything you need to have an edge on exam day. 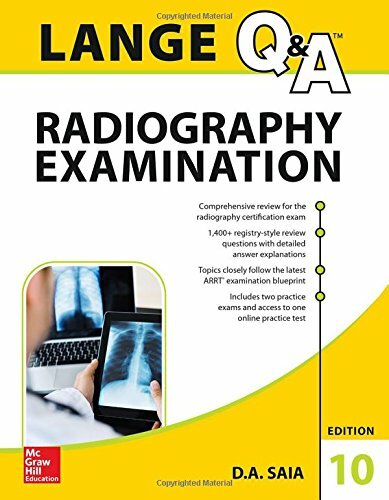 Now in its tenth edition, LANGE Q&A Radiography Examinationis more indispensable than ever, reflecting content updates from the latest ARRT radiographic examination blueprint. In addition, the book features important coverage of computed tomography (CT) technology within the chapters on radiation protection, equipment, procedures, and CT imaging. Also included with purchase is access to two online practice exams with 400 questions and answers.